SWBAT develop a conceptual understanding of how functions work through interactive games. Functions are fun! Students engage with functions through interactive games and activities. The purpose of this lesson is for students to have fun working with functions. There are a lot of great functions activities and games that I've come across from blogs and the internet and this lesson is a compilation of these resources. We start with a functions activity created by Dan Meyer. You can find the activity here. In this activity, students get to "feel" how functions work by following instructions about standing in 1 of 4 categories. At first, the categories are clear and there's a place for everyone to stand (how did you get to school today? type of questions). But then, things get more complicated when the categories are changed and students might find themselves able to stand in more than one place (stand under letter A if you're wearing white, letter B if you're wearing Blue). Students experience how functions work here and when a situation cannot be represented by a function by physically acting out scenarios. Next students play a Guess My Rule game developed by CME. In this game, one student chooses inputs to put in a function machine, and the other student calculates (in secret) the output. Student one continues to give inputs until s/he can guess the rule. Then students switch roles. The activity calls for the teacher to give students the functions they should work with, but students could also make up their own rule. 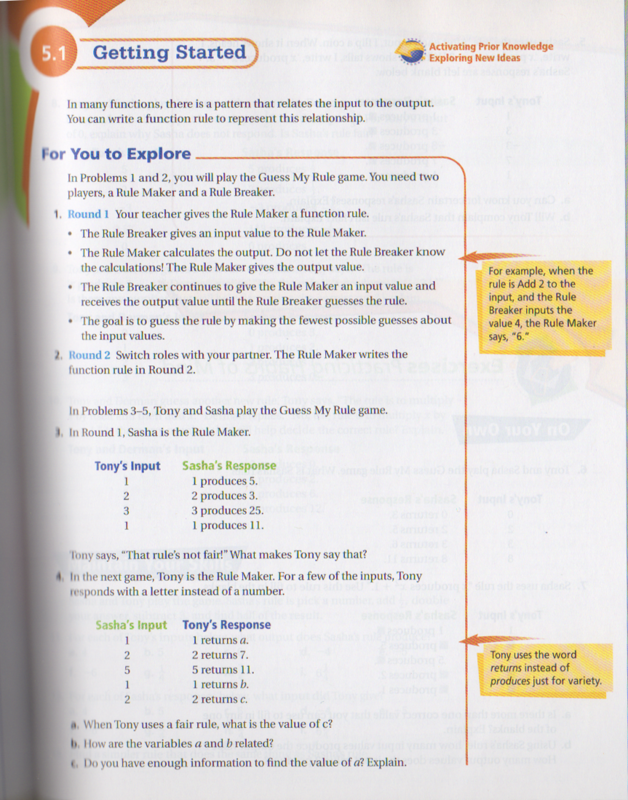 Next, students look at a conversation between two imaginary or example students playing the same game. Here, they see two different outputs for the same input and one of the students in the dialogue claims the game is not fair. Students have to examine why that's the case. The discussion after both of these activities focuses on what makes a situation a function. When does the game work and when is it unfair. Students can look at similarities and differences between both of the activities and state what they have helped them learn about functions. I want students to also take away the three key parts of a function, the input, the output, and the relationship between the two. And of course, I want students to articulate that in order for those three parts to work, there can only be one relationship for each input value. Based on your understanding, what are the important characteristics of a function? College Preparatory Mathematics. Fun Functions: Making Functions Active and Interesting. Web. 20 August 2015 Accessed. "Welcome to the CME Project Website!" Welcome to the CME Project Website! N.p., n.d. Web. 20 Aug. 2015.